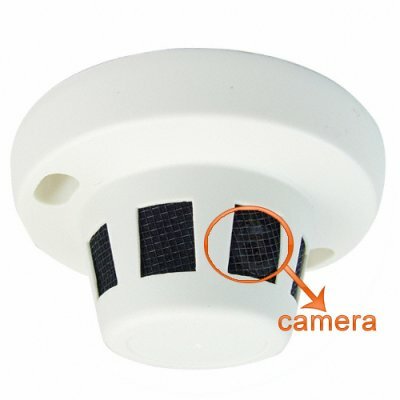 Successfully Added Smoke Detector Style Camera (Hidden Security Videocamera - NTSC) to your Shopping Cart. Smoke Detector Style Camera (Hidden Security Videocamera - NTSC). Smoke detector style security and surveillance video camera cleverly disguised as a standard ceiling mounted smoke detector. Dome camera disguised as a normal smoke detector for a completely covert security surveillance. The high quality 1/3 Inch SONY CCD camera hidden inside features image detection in light levels as low as 1.5 LUX as well as an adjustable lens fixture for wider or narrower viewing angle. The camera is mounted on an adjustable bracket for easily setting up the desired vertical viewing angle, and is easily connectible with any monitor or recorder via its RCA type AV cable. Stop the thieves and keep your business and home completely secure with the smoke detector disguised dome camera. Smoke-detector style security and surveillance camera with AV OUT to TV monitor or recording device. Great tool for the home or small business. Easy DIY (do it yourself) installation security camera. In today's high paced and stressed environment we constantly are thinking about safety and security. Has your wallet or cash suddenly disappeared after throwing a party? What about your mobile phone? You can never be too careful these days, so don't waste too much time thinking about security when you can install a disguised camera in your home and office, and have one less thing to worry about as you go about your busy life.